Once you’ve decided what recurve you want, we recommend reading our list of bow accessories you need to get to start shooting your recurve. #1: What Do You Want to Use it For? 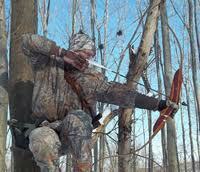 While every single recurve bow is suitable for target practice, not all will be suitable for hunting. However – and this is important to understand – the main parameter that determines if you can hunt with your recurve is the draw weight on the bow, not the actual model you purchase. In case you don’t know, draw weight refers to the amount of force you need to apply to the bow string in order to pull it over a distance of 28″ (in the case of recurve bows). The higher the draw weight on your bow, the more powerful it will be and the further your arrow will travel (and with more force). Let me explain why this is important. All you have to do is take a look at my recurve bow draw weight chart. With the help of this chart you can quickly determine the approximate draw weight range you’ll be able to handle as a beginner, by simply finding your body weight in that chart. It’s worth remembering that you can quickly build up your draw weight as soon as you start. So while you might not be able to handle more than 30 lbs. according to the chart above, after a few weeks or months of practice a 40 pounder will be more than manageable. If you’re main goal is target practice, then pick any recurve bow from our Best Beginner Recurves and you’ll be fine. If your main goal is to hunt, then any recurve bow will work too, as long as you choose one with a draw weight of 40 lbs. or more. 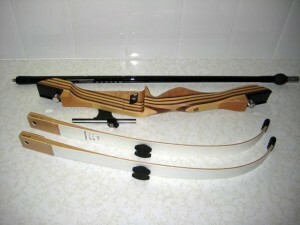 Almost every single bow available on the market can be purchased in the 40 lbs. 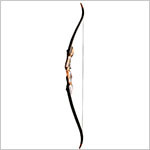 variety, so you won’t have any trouble choosing a recurve bow suitable for you. Also, as Cody Assmann points out in this article on choosing a recurve, the longer bows are more accurate, but more difficult to lug around in the field and/or comfortably fit in a blind. Therefore if hunting is your primary objective, consider the length as well and avoid anything that’s over 62″, and preferably even 60″. #2: Do You Need a Take-Down Recurve? A take-down recurve is easier to service. If anything were to break by accident, you can simply remove the part that needs fixing and send that for repair / servicing, rather than having to send the entire bow. Finally, a Take-down bow is good for beginners because it allows you to adjust your draw weight. Basically, the draw weight of your bow is determined by the stiffness and construction of the limbs. So if you were to buy a recurve with 30# draw weight, and you were to decide a few months later than you want to upgrade to 40#, you don’t need to get a whole new bow – all you have to do is purchase a new set of limbs with the draw weight that you would want to upgrade to, and replace your current limbs. #3: How Heavy Should The Bow Be? #4: How Long Should The Recurve Be? You want a bow that is at leas twice as long as your draw length. If your draw length is 28″, you want a recurve that’s 56″ or more. The longer the bow, the more accurate it generally is. If you don’t know what your draw length is, please see this guide. #5: Do You Want Accessories on Your Recurve? Another thing to consider when deciding which recurve bow to choose is whether you want to attach a bow sight and other accessories to it. Some recurve bows come pre-drilled for such attachments, while others don’t. Many traditional archery enthusiasts prefer not to use any sort of sights or accessories, simply because they prefer the pure “stick and string” experience. However, even if a riser isn’t drilled for these accessories, you can still add a simple peep sight (which can be attached to the string of any bow), or a glue-on arrow rest. See the “Extra Accessories” section below for more info. #6: What Arrows Should I Get? Since the subject of arrow selection is quite subjective, you should read our article dedicated to the subject: how to choose arrows for a recurve bow. This will get any beginner started. #7: What Other Accessories Do I Need To Get Started? You will need to get a few extra accessories, in addition to your bow, before you can start shooting. For a complete list of what you need to get started and what is optional, see our list of required accessories. Choose the draw weight according to your body type, and make sure that you go for at least 40 lbs. draw weight if you want to hunt. For target practice, any draw weight will do. 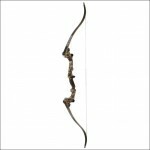 Decide whether you want a Take-down bow or a one-piece based on the information provided above. Make sure that the weight of the actual bow is no more than 3.4 pounds for starters. Get a bow that is at least twice as long as your draw length. 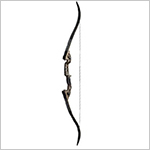 Decide if you need a bow that is drilled for extra attachments such as a bow sight. hello thanks for the guide its really help me.. want to ask you one thing.. can i combine limb and riser that have different brand? If I were stuck in a survival situation and I had to make a recurve, arrows, and arrow heads out of the surrounding trees and rocks to hunt with BUT I was lucky to have a premade bowstring on my person. what premade string would you recommend?